Patti wrote: My main argument against your loop argument is that you insist on completing the BLANK spaces in the way that pleases you. My as you call it spagetti image is extremely accurate and there is ABSOLUTELY no loop! None whatsoever. If you look closely you can even see the rounded edges of the ending of the ridges that you are trying to make a loop. You can also see the upthrust sits on the horizontal ridge and yes, it forms a triradius. You have been drawing a second triradius to the left instead. Color in the image below without ignoring the actual endings of each and every ridge at the center and show me a loop. Use transparent shading. Include the Type lines. Martijn, I have truly tried to see the loop you draw, but it really isn't there. And yes, I do disqualify the blown up distorted, blotchy images you are presenting from the 1937 prints. You mentioned that this was the first time I mentioned more than one upthrust. Actually that isn't true. I can't find it tonight, but I drew them in the colors above. I mentioned in another post something like "you can take your pick as there are more than one". So I have mentioned more than once that there are several upthrusts. Maybe even up to 4! Also, yes I know ridges do not cross each other they abutt - I changed colors at the abutting ridges. One good thing that has come out of this discussion is all the information that has been shared and I feel a lot more confident in identifying. 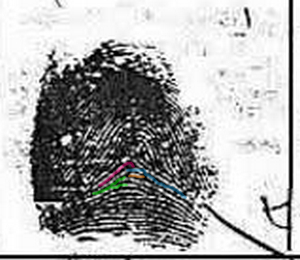 I am now very confident that I have identified my fingerprints correctly. Thanks for the replies. Returned from 2 weeks holiday, catching up on the forum. Wow, you guys have worked hard on this! Thanks, I love these discussions where we thrash out tiny details of dermatoglyphics! It's a very complex discussion to follow . I doubt that you two are ever going to agree on it!! Yes I saw the first example (1937) as a radial loop. Interesting to see the 1933 example which at first looks like a tented arch! I can still see where I thought the loop was, but it's confusing...with the black spots & white patch. I thought the white patch could be a scar or cut - if you look higher up the fingertip there are white patches where bits of skin ridge are missing. I guess it is the illustration from Lion's Paws? I wish they'd used less ink! Sorry I have nothing useful to contribute at this stage! Yes Patti, I had the same problem yesterday - it appeared to be a problem on the servimg.com website. But now my problem is solved... so I expect that you will no longer suffer on that problem as well. 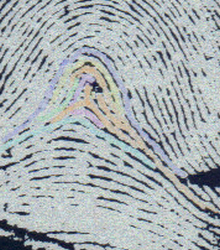 Patti, picture 156 does not correspond at all with Walt Disney's fingerprint, because in picture 156 we can clearly see that there are actually 2 terminating ridges (because they are not directed to eachother). Patti, this is an example of how you are sometimes 'fooling yourself'! And instead, Walt Disney's fingerprint comes very close to the situation in picture 155... especially if we add one more line: the red line! My reference to picture 155 is obviously applicable to the problem with the 'large white zone' in the 1933 prints (+ the corresponding zones in the other two prints). "I believe I have addressed and discounted all of your theories... "
My assesment is founded on the similarities between all three prints, as seen in the picture below; and obviously, the coloured line relate very much to picture 155... and to picture 156. How on earth can anyone deny that there are similarities between all three pictures? Or even qualify these similarities as an 'irrelevant' coincidence? Because I think these pictures illustrates that I did not build my assessment on any 'tiny' lttle aspect in those pictures. Patti... while 'your upthrust'-theory really requires to ignore the fact that the connecting INK DOT (between the core ridge line & the lower ridge line) is seen in only two prints that CEARLY show an abundance of ink; you also ignore the fine quality of the LIGHT 1937 print'! Therefore I call 'your upthrust'-theory a delusion, but you showed hardly any sensitivity for the details that I have described... and now you are even suggesting that I am sort of trying to trick you by calling me an 'illusionist'. I guess you actually highlightened yourself the 'competitive nature' of your arguments. But I noticed & pointed out where the prints & examples do not confirm what you described with words. And for me it is stricking to see... that you never really confirmed any detail of my statetements & visual illustrations. Contrary, I have always tried to answer your questions, and give you confirming feedback on points where you were able to add an element in our discussion, and I admitted the (small) mistakes that I made regarding minor issues in my (former) drawings. I did what can, but have never been 'catching flies' (my thoughts regarding your Mickey example include a fundametal issue) and always tried to foccus on significant mistakes. But I think the time now arrived to take my attention away from this discussion. Anyway... Miss , thank you for your efforts!! Lynn wrote: Returned from 2 weeks holiday, catching up on the forum. Thanks for sharing a quick thought about the 1933 print. I am pleased to hear from you that you in that picture you can see the ridge lines as well where you thought the loop was in the other two pictures. And I fully agree... the 1933 picture presents confusing elements. Regarding your idea of the option of a scar or cut for the white patch... yes that zone in the 1933 print looks like it could have been caused by an unnatural factor. And obviously the other 2 prints show the presence of a ridge line. That is why I described that elements in the 1993 print as a flaw. ... Lynn, your quick comment sounds to me like you and I already found at least one significant point of agreement about that 1933 print!! ... While even after 4 days of discussion I think I never arrived at a likewise significant point-of-agreement about the 1933 print with my major discussion partner so far. PS. In order to take away a large part of the confusion, I think you basically can focuss on the last picture in my former post - because that picture highlights far most of the (essential) zones in all three prints that Patti and I considered in this discussion. - Patti suggested that my 'gold and green lines' (see again the last picture of my former post) show similarities with example 156 in the F.B.I. book. - While I recognize the conflicting element between the 156 picture and Disney's fingerprint; and instead... I actually preceeded her 156 picture example by pointing that I observe significant similarities between example 155 and Walt Disney's print. NOTICE - To avoid any confusion about example 155: I added the red line just to illustrate how it represent the striking similarities with Walt Disney's print. I woke up this morning with this on my mind. Also words that begin with ob. Like obfuscate objurgate and obtuse. You do realize that you have gone off rambling about insignficant features that do not change the fact that Walt Disney's fingerprint is absolutely not a loop, not even trying to be a loop. You have ignored the plain and simple rules from the FBI's "The Science of Fingerprints". Or you just cannot grasp their details. Perhaps it's a language issue. Basically I showed you in my posts last night that no matter how you draw those upthrusting ridges, they still qualify as a tent. You have repeated that process in order to try to make us see a loop. Or the possibility of a loop. The only ways you have been able to describe a loop is by filling in what could be missing inked areas or erasing other inked areas. Yet even in that process, there is still a tented arch. I have offered plenty of facts to support my argument that we are obviously seeing a tented arch. I have offered many references that describe the features that rule out loop and illustrate tented arch. You have chosen to ignore these. I have yet to see your qualifications that authorize you to rewrite the rules to support your agenda. I'm sorry you are unable to accept or understand that. p.s. The image that was cut off was part of my inability to upload images. I had to upload them on my website and via my forum to transfer them here. Since the images on the board were altered, I included the link. I figured most people had enough common sense to see that. By the way, you do know that you drew a qualifying tented arch in the 155 sample?? I also pointed out that even if the ridge that you would like to call an ink smear is actually not there - there is still a tented arch - as seen in the red line you drew and the one already drawn in 156. Tented Arch. So even if we say that the white space has a continuing ridge. The ridge it joins to is at right angles to the upthrust. The abuttment spoils a recurve. Tented Arch. Therefore, even when I allow you these exceptions, there are still rules in place that qualify this print as a tented arch. Although you don't realize it, I'm sure, you have helped to illustrate we really have a tented arch here. 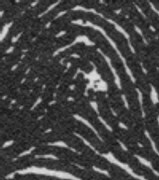 Regarding the whorl in the right index finger: yes, I can find the terminating ridge line on the right side of the 'core of the whorl'. By the way... I can understand your association with an 'upthrust', but in the F.B.I. book this terminating ridge line would not have been described as an 'upthrust', because that ridge line obviously does not raise from the HORIZONTAL PLANE - because the left part of the connecting horizontal ridge line... is actually a constructing ridge of the whorl! You are completely ignoring the MIRROR-effect that really should be considered when comparing the finger of a right hand with the finger of a left hand!! 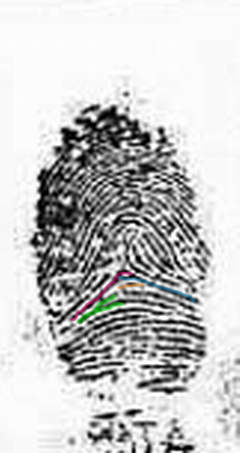 And therefore... it doesn't make sense at all to even associate the clearly visible terminating ridge line in the right index fingerprint, with the UNCLEAR situation in the left fingerprints. I think your example illustrates again how you are trying to find evidence in details, which is basically a fine objective... but you also make obvious mistakes. Patti, you claimed for your experience, but in this issue of comparing the right finger with the left finger you did not include the mirror-effect in your considerations, also not in your latest comments after one night of sleep ... this could easily be described as a 'beginners mistake'. PS. I think we can easily agree about the quality of the right index fingerprint: it is excellent... especially since we can follow here the path of EVERY SINGLE RIDGE LINE quite easily. 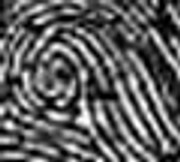 And obviously in the left index fingerprint we are confronted with a much worser quality, and I can not understand why you never confirmed that there were elements of confusion. "I believe I have addressed and discounted all of your theories.."
Mirror effect. Actually I did take this into consideration. 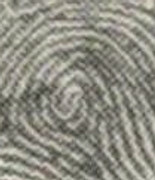 I also took into consideration the Radial nature of the tented arch pattern in the left index finger. In my opinion that would negate the mirror effect. You have misunderstood the meaning of the horizontal plane. Remember 156 is a tented arch. I love you Lynn but you have a reputation for being polite and diplomatic at times like this and staying conveniently on the fence. Me - I just go out there and ruffle feathers calling it like I see it. Patti wrote: By the way, you do know that you drew a qualifying tented arch in the 155 sample?? Patti, formally that is a correct observation: (edit:) with my red line it becomes a 'tented arch'. 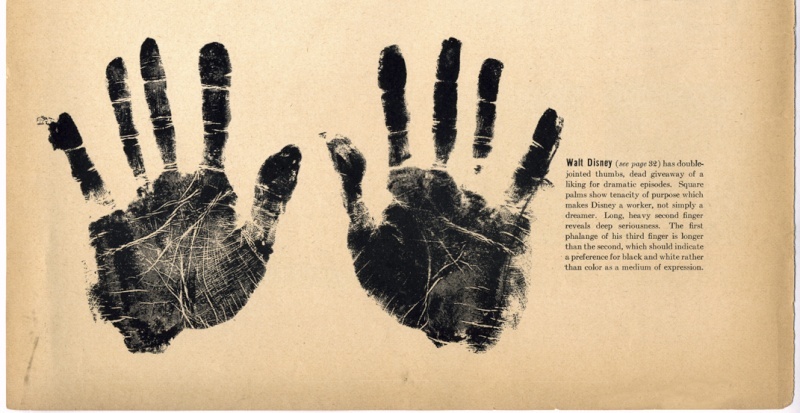 I started using the 155 example in the perspective of our disagreement about the small white spots in Disney's fingerprint, specified to the zone of the LARGE WHITE SPOT. 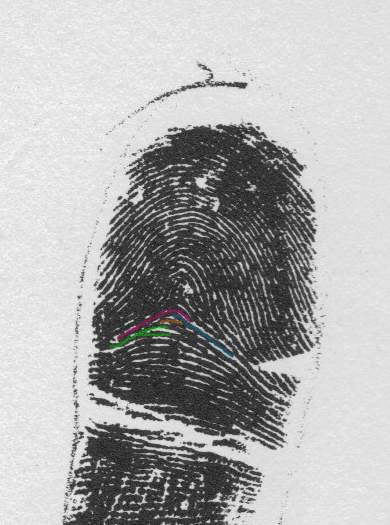 And I added the red line to create a major visual similarity with Disney's fingerprint. But for the 'visual effect' there was no need at all to add more element from the Disney fingerprints,,nor to mention for example that it only makes an MIRROR IMAGE, etc. Patti, formally that is a correct observation. I just addressed all three of these things. If you feel there are two upward curving ridges without a horizontal short ridge connecting them match what you drew in 155 and what is already in 156 - this is a TENTED ARCH! No where does it say that the ridge that forms an upthrust must ONLY be connected to a ridge from the horizontal plane. Read the 3 types and also read the exceptions. I quoted them in black in last night's posts. Study the FBI's illustrations. Your argument now seems to only be based on your misconception of the horizontal plane. Once you see this error on your part, you will see that I can now say "checkmate"! - and the 'upthrust' includes an angle of about 90 degrees (only 45 degrees is required). But none of both characteristics is seen in the Disney print!! PS. Now, you can try to describe why you assume that I misunderstood the horizontal plane... but I don't expect any detailed from you side, because the details that I just described illustrate that I know exactly in any part of this discussion what I am talking about. You post isn't making sense. Can you draw the differences you are trying to describe? What you see in 156 that you are not seeing in Disney's print when you take away the dark spot. Any upthrust makes a pattern a tented arch. These upthrusts are part of the center that is not corresponding to the horizontal plane ridges and not part of the ridges that are arching over the top of the center pattern. They are the central pattern. 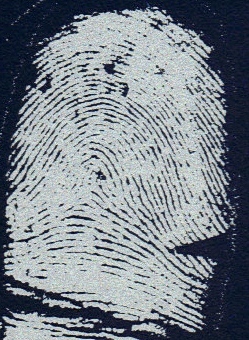 The illustrations in The Science of Fingerprints show various examples. Sometimes it's just an upthrust sitting on a small horizontal ridge. Sometimes it's like in 156 the upthrust is there but it's not sitting on another ridge. Even if you exclude the 2nd type that relates to a horizontal plane, this pattern still qualifies under the 1st type as an angle. I'm allowing you all your exceptions and it still fits the description of a tented arch. The references to "horizontal plane" are highlighted in blue. Just scroll. "... An upthrust is an ending ridge line of any length rising at a sufficient degree from the HORIZONTAL PLANE, i.e. 45 degrees or more." This means that a 'connecting ridge' is not a requirement, but there can only be an 'upthrust' when it concerns a line that is positioned at least partly (just) above the rest of the HORIZONTAL PLANE. Yesterday, I have used Google books to check all pictures in the book where an 'upthrust' is discussed. And I noticed that all 'upthrust' examples in the F.B.I. book show indeed this characteristic as described in the definition. And this made me realize as well that actually that both of 'your upthrusts' (that you presented in the Disney pictures)... do not show this essential characteristic. The lines involved in 'your upthrusts' are not: '... rising from the HORIZONTAL PLANE'. All details point out that you misunderstood how an 'tented arch' is created with an 'upthrust'. (But I can understand your misunderstanding as well... because the issue of a recognize an 'upthrust' can definitely be described as an advanced aspect of fingerprint assessment). I posted these very early in this discussion and you were in agreement with the colored ridges as matching on all three prints. The horizontal plane on Disney's print consists of these ridges. Above these ridges is the central pattern. Above the central pattern the ridges return to flowing from one side to the other. The 1933 print is the one where you would like us to not see the white space and not see the dark horizontal spot that connects the two upthrusts. In the lighter 1937 print, this tiny angle is seen as abutting the ridge with the crescent moon shape on top. An angle. Tented arch of the 1st Type. 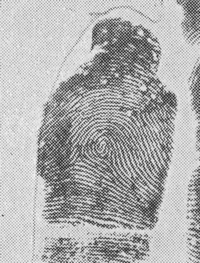 In the 1933 print, you can choose to fill in the white space, eliminate what you think are ink smears and the print still conforms to the rules of a Tented Arch. Please Martijn, respond to this post and if you need to change the subject or shift the perspective please do so in a separate post. Yes!! Or it can be connected. Either fits the rules. Patti wrote: You post isn't making sense. The major characteristic seen in 156 example concerns 2 aspects: we see the 'upthrust' coming from the RIGHT SIDE, and there is (1) no doubt that the 'upthrust' is not connected with the other terminating line, and secondly (2) but the other terminating line is coming from the other side: the LEFT SIDE. While in the Disney print, both concerning lines come from the same side. Just like in the 155 example after I added the red line!! So, this this combination of 2 aspects is the main reason why I rejected the example 156... and instead recognized how example 155 (even without my red line) at least shows the similarity regarding the 2 terminating ridges that directed towards eachother. That is why the lower terminating line is NOT recognized as 'upthrust', resulting in that the F.B.I. book describes it as an arch!! Patti, I hope this now make sense for you as well. But, Martijn, it's not a problem that there are two coming from the same side as you describe in the 1933 print. You simply use the one closest to the horizontal plane. The rule of "even the slightest upthrust creates a tented arch" applies. If you are trying to make these two be a loop, remember it is spoiled by the right angle formed by the abuttment. There are rules for tracing this ridge. There isn't a flow for a loop. Even in the darker print of 1937 this angle is present. Does not matter what we choose to see in the dark areas or white areas, the abutted ridge spoils the recurve. No recurve no loop. 156 is described as a tented arch in the book. 155 is not a tented arch because the uprising ridge continues in the blank space to flow into the next ridge (a to b) and then becomes a ridge that flows from one side to the other. Your red line creates a tented arch. You are the one who is confused here.